The grades of coffee on packages of Kona Coffee will help you separate merely good coffee into truly outstanding coffee. The problem is, they all have pleasant sounding names: Kona Number 1, Kona Prime, Kona Extra Fancy, etc. ; but if you’re aware what each label truly means, you will become one of the few truly elite purveyors of Kona Coffee. The Kona Coffee Grading system came out of a crisis in the 1980s where the label “Kona Coffee” was being placed onto any kind of coffee from anywhere. Back then there was no laws about what could have the label “Kona” on it. The Kona Coffee farmers were struggling mightily, since it costs much more to produce coffee in Kona than in other regions of the world. While that hasn’t completely solved the problem of impostor Kona Coffee (remember to avoid “Kona Blends”), it goes a long way in maintaining that the brand “Kona Coffee” stands for true gourmet coffee. How are the Coffee Beans Separated? The classification looks at the coffee beans’ size (bigger is better), shape, moisture content (which equals more flavor), and number of defects it contains. Essentially what this means is that the highest grade coffee, Extra-Fancy, contains the largest, most moisture-heavy and blemish-free coffee beans. Recently, Starbucks released a Kona Coffee (which I reviewed here) that uses only Extra-Fancy beans, and the difference in flavor is substantial. Other coffee regions have exactly the same beans, however they don’t separate the coffee beans with this exact of a classification system. As a result, you get a “one size fits all” approach to coffee, where sized beans are processed and roasted together, meaning that some beans’ flavor is under-extracted (larger beans), and over-extracted (smaller beans). 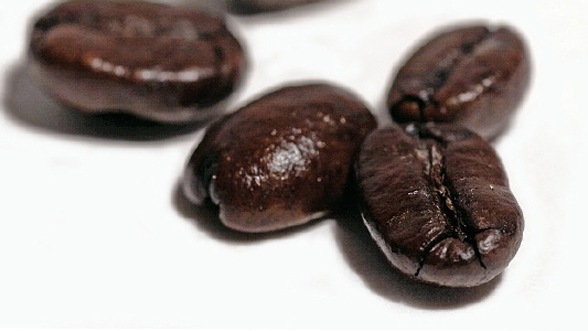 The Kona Grading System allows for Roastmasters to perform a more exact flavor extraction. This is the cream of the crop, the largest, most moisture heavy of all the kona coffee beans out there. You tend to pay a little extra for extra-fancy beans, but they will usually reward you with a cup that stands above all the rest. Defects: 10 or less full imperfections per lb. Other Beans: 50 or less other type beans per lb. Defects: 16 or less full imperfections per lb. There is Koa Coffee’s Estate coffee, of which it is comprised of the 3 top grades: Extra-fancy, Fancy, and Kona Number 1. Defects: 20 or less, full imperfections per lb. Other Beans: 50 or less, other type beans per lb. When a coffee label doesn’t specify what grade the coffee is, it is usually Kona Prime. It isn’t bad coffee, but it tends to be in the more affordable coffee packs, as well as comprising the 10% Kona coffee in one of those evil “Kona Blend” coffees. Defects: 25% defective beans, by weight. Included therein no more than 5% by weight sour or black beans. We’ve covered the differences between Peaberry Coffee Beans and Regular Coffee Beans, but suffice to say if you want great gourmet Kona coffee, the best of the best, then you’ll have to choose between Kona Peaberry and Kona Extra Fancy.